Psst — see the bottom of this post for a fun freebie! Ladies and gents, I present to you the Thanksgiving side dish of. your. DREAMZ. I feel quite blasphemous suggesting that you break with your traditions and add this casserole to your Thanksgiving menu when my family, in fact, has been serving the exact same foods (including this casserole) for years upon years upon years. We never stray, ever, right down to the cranberry sauce in the shape of a can. We are a stubborn holiday dinner folk. But if ever there was a time to shake things up, or if you’re just getting your own Thanksgiving traditions started, I implore you to give this five-ingredient casserole a try. It’s amazing — to the point where I literally don’t even remember a holiday when my mom hasn’t made at least a double batch of it and it’s gone before the weekend. That’s 27 years of baked bean casserole eating/loving, you guys. I rest my case. Of course, I know what you might be thinking: MEAT. So much meat. And that’s the reason I hesitated a hot second to post this recipe — because you know by now that the hubs and I are kinda picky when it comes to eating meat and such. But here’s what I discovered when I made it for the first time on my own: It’s just as delicious with grass-fed ground beef and humanely raised bacon. So there’s a little nugget o’ information for ya. Now we can all rest easy, go forth and eat all the casserole. But before I let you go, let’s talk about what’s going on here: A super-easy, super-simple, super-yummy-in-my-tummy Thanksgiving side dish, that’s what. 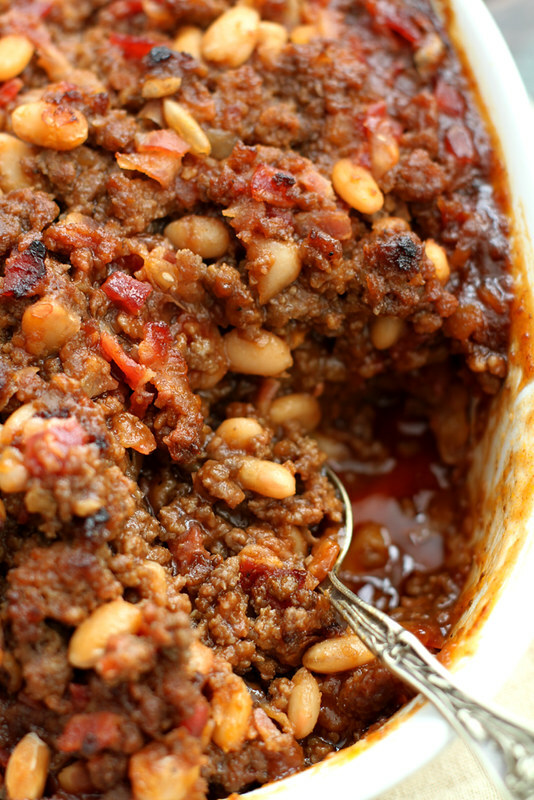 You mix cooked ground beef, crumbled crispy bacon, Northern beans, brown sugar and barbecue sauce. You put it in a casserole dish. You bake it. You eat it. You eat the leftovers cold with crackers the next day. The end. You’re going to love the heartiness of it. You’re going to love the crispy, salty bacon paired with the sweetness of the brown sugar and barbecue sauce that caramelize in the oven. You’re going to love mixing it with mashed potatoes and cranberry sauce in one bite because that’s how we do. And by “we” I mean I. But you should, too. And because my 27 years of experience eating this dish — as well as the other dishes we so fiercely stand by for our Thanksgivings — obviously proves their deliciousness, I’m going to share another one of our favorite recipes later this week. So get excited! This is just the start of all the yummy yum Turkey Day yums. Oh, P.S. 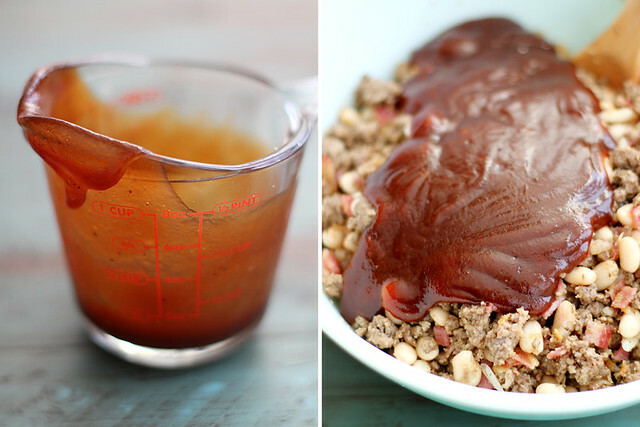 This + those pumpkin brioche rolls from last week = best ever Thanksgiving leftover sloppy joe. You best believe that’s happening. 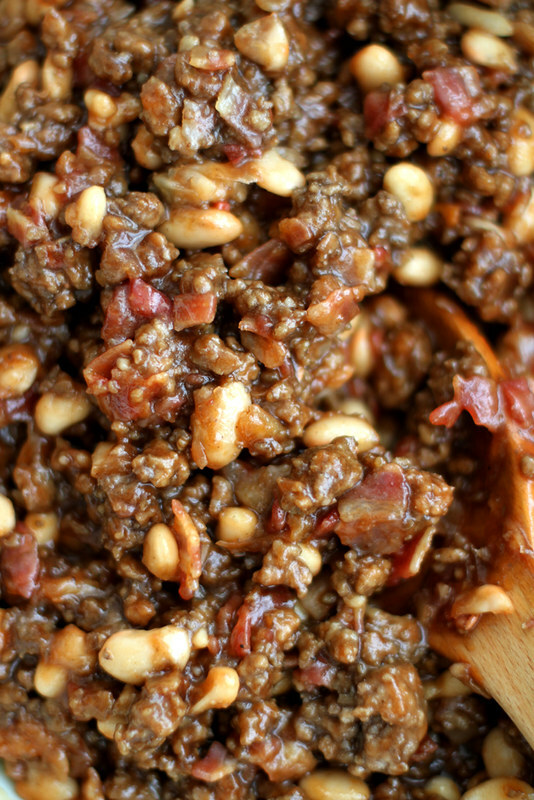 Heat oven to 375 degrees F. In a large bowl, stir together cooked ground beef and chopped bacon to combine. Add beans, brown sugar and barbecue sauce. Stir until just combined. Pour mixture into a casserole dish. Cover and bake 45 minutes until bubbly and warmed through. Let cool 10 minutes before serving. P.P.S. Check out the haps below: If you sign up for Girl Versus Dough post updates to your inbox, you get a free eCookbook of my top recipes! Everybody gets an eBook! I feel like Oprah right now. Anywho, you should sign up. Pretty please. Stephanie, this five-ingredient casserole looks so good and comforting. . and yes to grass-fed ground beef and humanely raised bacon. And, well, the fact that you have been eating this for 27 years says it all!! Thanks for sharing! Mom knows what’s up! This looks amazing! This casserole looks so delicious! I can’t wait to try it! 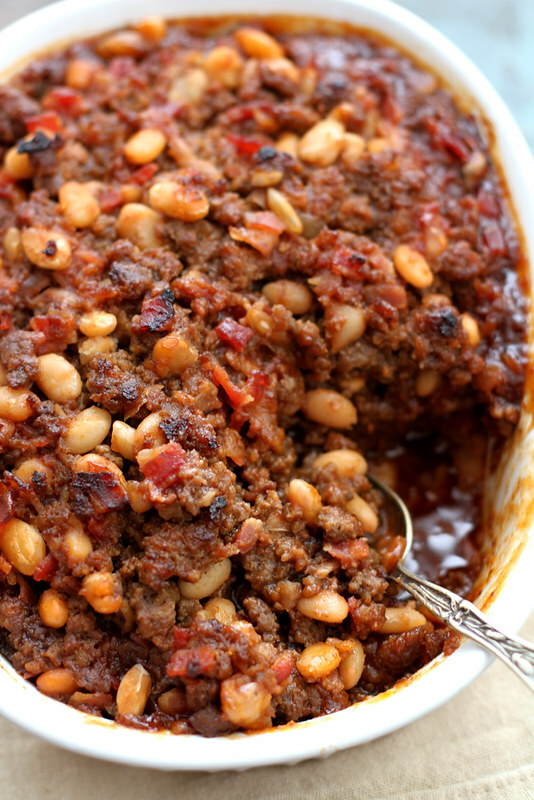 Some of my family love a baked bean and beef casserole that I make. I use it for the main dish. Mine doesn’t have bacon and I use pork and beans but through out that pork floating on top. Couldn’t stand that in my mouth. Ha!!! WHOA!! This casserole! Your mom is one awesome cook because this looks incredible! The ONLY meat dish I truly like is sloppy joes and this is like sloppy joes on steroids. YUM. Then when you said with the pumpkin rolls?!?! Omg, girl. My boyfriend would LOVE this. I’m imagining it on top of a baked potato. YUM! 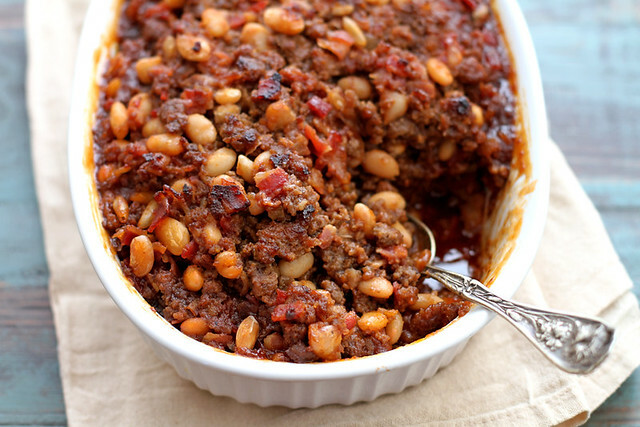 Love love love….This Bean casserole is all you need! My Grandma made this and my 86 year old Mom, who lives in southeastern MN, makes it often to rave reviews. I live in Florida now and want to thank you for reminding me of this yummy gem of a casserole. Stay warm and Keep posting, love your blog! This sounds like a total flavour bomb – love it! Wow, I never ever thought I could get so excited about baked beans, but here I am, captivated by this lovely casserole!! It definitely looks worth a try. Bring on the meat, momma! Now that I’m an aaah-dult, I’m all about starting my own holiday traditions, and I can totes see this casserole being one of them! Can I add all the cheeses to the top? Heck, can this casserole BE my Thanksgiving feast?! I want to make this just for the leftovers! That sandwich sounds incredible! What a delicious, hearty side dish! This would disappear around my family in no time! Sune — Ummmm YES. A thousand times yes to that idea. Julia — YES TO ALL THE CHEESES. I’m so on board with that. This casserole looks absolutely delicious! I used to not be a fan of beans at all, but now I’m all about them 🙂 and loaded up with bacon?! Yes please! Screw tradition! 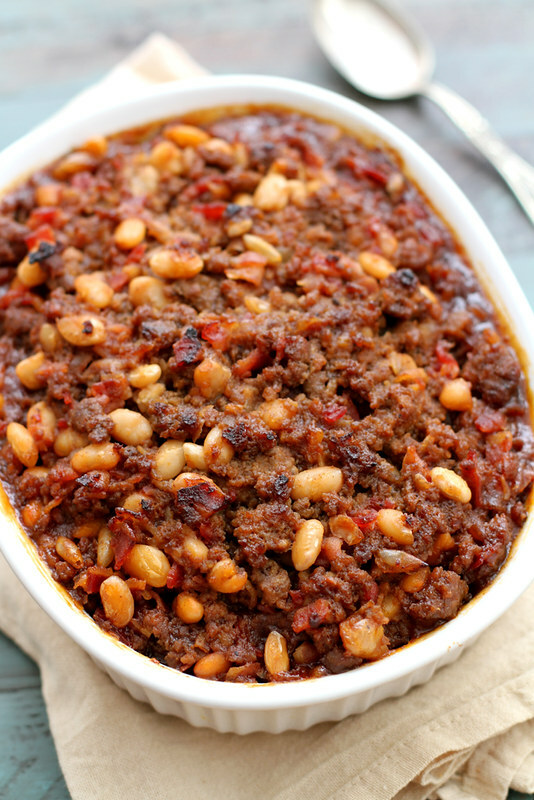 I’d like this on my Thanksgiving table, that crunchy topping alone is worth nudging a side dish out of lineup! I don’t eat meat anymore but my former meat-loving self would’ve died over this recipe! My BFF just had a baby and I was looking for an easy casserole to bring to her next week, and ding. ding, ding, we have a winner!!!! Oh my gosh your sloppy joe idea! my mom used to make a recipe called “calico beans” that was similar to this and I LOVED IT. My mouth is watering right now, I will be making this soon! I can definitely see why this is a family favorite! So much comfort all in one casserole! I can’t say that I would serve this at Thanksgiving BUT(!) I can see this making a debut at a football party! I kinda want to make this for dinner tonight. It looks so good! Oh man. I would love to join your stubborn holiday dinner table is this is on the menu. Mom, you’re a genius. Mother knows best. I bet this is delicious. I had not eaten red meat for almost 6 months and decided to cheat with this recipe. I was excited to make it, but was a bit disappointed. Flavors were too strong and its too meaty. To make it more balanced for my taste, I added mashed potatoes (like shepherds pie) and grated cheddar on top. It would be better, IMHO, if there was less of every ingredient with exception to adding more beans. I’m glad I tried it, but probably won’t be making it again. Sharon — I’m sorry to hear you were disappointed! It’s definitely best eaten as a side dish because the flavors are rich; that being said, I know it’s still not for everyone. Thanks for trying the recipe anyway! Em — Aaaand I kinda like the way your grandma puts the bacon on top! Either way is a win, though, because bacon. I’m going to print this out immediately and make it for my husband because I will be a HERO. Glad you shared! it’s very sweet. like dessert sweet. 1 cup of brown sugar is a bit excessive. it needs 1/2 more bacon and/or salt.